Whilst browsing Brixton Market recently, I became very hungry. So I started looking for something to eat. After going past various places that don't have much of a veggie selection and trying to find Casa Morita (but only finding it after I had eaten) I came across El Rancho De Lalo Restaurant. My friend decided we should dine at this place because neither of us had tried anything like it and it was intriguing. The portions were big, the food is good and its the strangest mixture of things, but it all works very well. 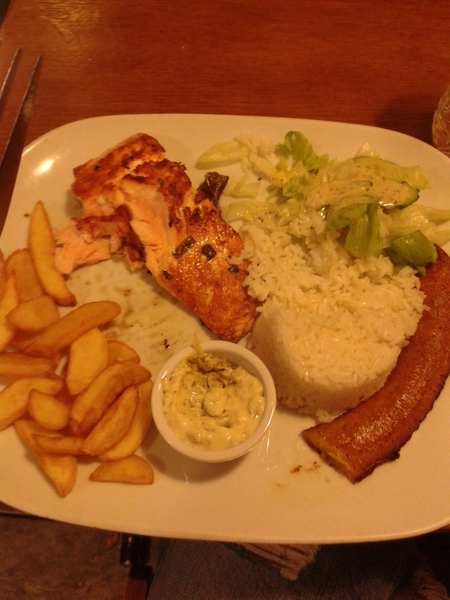 I went for salmon, that was served with rice, salad, chips, tartare sauce and plantain. Like I said strange mixture but it worked very well together and with so many sides on one place, you will never need to order a side. Also reasonably priced at around 15 pounds per person, it wasn't bad at all. They are also known for their chicken and steak dishes, so don't be put off if your a meat eater. Many people were enjoying the range of food. Overall I liked this place, it wasn't too busy, was good food at a not-so-bad price and had a cosy home feel to it. I am not sure if it was authentically Colombian but it was good. The only thing I would improve was the service, we weren't asked if we were happy with the food once if it was served or approached at all once we had finished eating. But that is a small detail and something that can be easily fixed.